With POET Compact the user can listen to a variety of written texts, by simply pressing a button - without the need of studying long and complicated instructions. All that the user has to do is to put sheet with the text he want to hear it read in the scanner - like a copier - to sit comfortably and the rest is made by Poet. There is no need to have experience with computers to be able to operate this device. All necessary components are integrated into a stylish case that has a few buttons on the front side. All that the user has to do is to plug the cord in, to start the device, and this it will start to read the document in the scanner. POET Compact automatically recognize position of the pages in the scanner, makes an image of the page, which it then converts the text and reports this text to the user - there is no constraint for English. 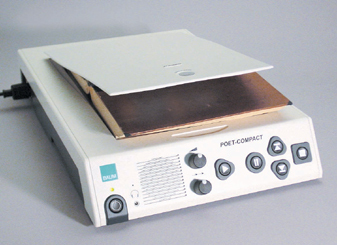 Although it is easy to use, Poet Compact offers quite many additional functions. The user can change the speed of reading - slow, normal or fast, and the tonality is not changing. There are several languages to read: German, French, Italian, Spanish, Russian, Dutch, Danish, Swedish. More languages can be present on the same Poet device. 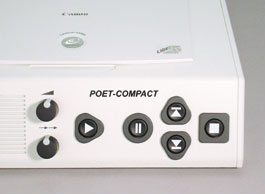 POET Compact uses a professional instrument for playback, which is offering comfort in hearing the text. The speech fragments are not created artificially, they are built using a human voice so it sounds quite natural what Poet report. 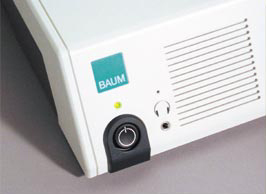 In addition to playing Speech, POET Compact provides the possibility to output Braille information. POET Compact has an enormous storage memory: the containing disc can store an enormous amount of pages that can be recalled and read again. It has enough space for storing 500.000 pages. Which means that the POET Compact user can read from memory for about 10 years - if it is calculated that a page is read in about 3 minutes and that the user can listen to an average of 8 hours a day - all this with the condition that the information will be given to the device before it is asked to report it. Saving a document is very simple: the user simply has to say in the microphone a name for the document and press the corresponding button, nothing more. Using the given name, the user can find and listen to the text later. Beside the start button there are only 5 other buttons that you can press and two wheels that can be rotated. All buttons are big and easy to find and have tactile markings for better recognition. A menu that vocal plays chosen option ensures a easy and fast way to use. If you want more information, please send us a message with any concerns/questions.